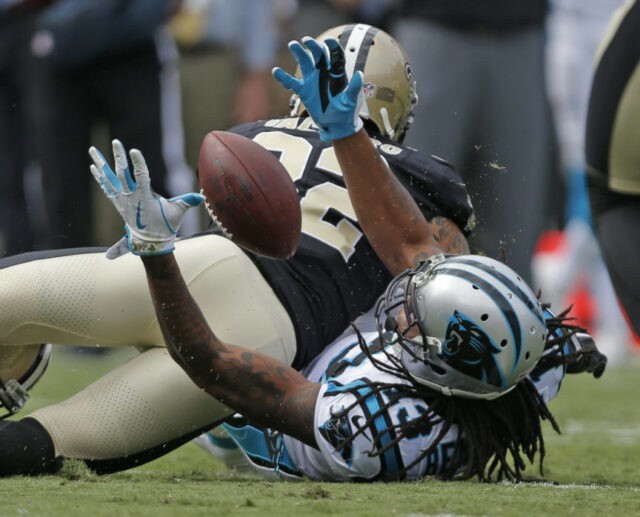 The Panthers have ruled out wide receiver Kelvin Benjamin for the rest of the game. Benjamin’s knee was bent backward after making a catch at the end of the first quarter and he did not return. The Panthers all already without tight end Greg Olsen, who is out at least eight weeks a broken foot so it’s no surprise their offense is struggling against the Saints 32nd-ranked defense. Frank Gore celebrated his 3,000th carry with a 4-yard TD run to give the Indianapolis Colts a 28-7 lead over the Cleveland Browns. Gore is the ninth player in league history to join the 3,000-carry club. Eagles defensive tackle Fletcher Cox is questionable to return with a calf injury, leaving the defense without four of its best players. Philadelphia already didn’t have cornerback Ronald Darby and safety Rodney McLeod and linebacker Jordan Hicks left the game with an ankle injury. And Eagles running back Darren Sproles is questionable to return after injuring his right wrist on a carry in the second quarter. Baltimore Ravens wide receiver Jeremy Maclin has been cleared to return in Sunday’s game against the Jacksonville Jaguars at Wembley Stadium after being examined for a possible concussion. Maclin underwent the standard concussion protocol after hitting his head on the ground during the second quarter, but the team announced after the halftime break that he had been cleared by doctors. Maclin was hurt when Joe Flacco’s pass came off his hands and was intercepted by A.J. Bouye, and the wide receivers head then seemed to bounce on the turf as he fell down. The Jaguars led 23-0 at halftime. Baltimore Ravens wide receiver Jeremy Maclin is in concussion protocol after hitting his head on the ground during Sunday’s game against the Jacksonville Jaguars at Wembley Stadium. Joe Flacco’s pass to Maclin was intercepted by A.J. Bouye during the second quarter after it came off the wide receiver’s hands. Maclin’s head then seemed to bounce on the turf as he fell down. Baltimore Ravens defensive end Brent Urban has a foot sprain and is questionable to return in Sunday’s game against the Jacksonville Jaguars at Wembley Stadium.